In a region that’s incredibly rich in wildlife throughout the year, between the popular Moru Kopjes and on the periphery of the busy Seronera area, Dunia Camp has managed to create a remote retreat which feels a million miles away. This award-winning, permanent tented camp is perfectly positioned to catch the wildebeest Great Migration which literally passes through the camp, but is also excellent for game viewing in the Central and Southern parts of the Serengeti National Park. Set amongst the trees with herds of elephants roaming nearby, it is undoubtedly one of the finest camps in the area. Situated in the central Seronera valley, which is home to some of the best resident game in the Serengeti eco system, guests can expect to see an abundance of lion, leopard, elephant and cheetah, and perhaps even the elusive black rhino. This is Big Five game viewing territory. 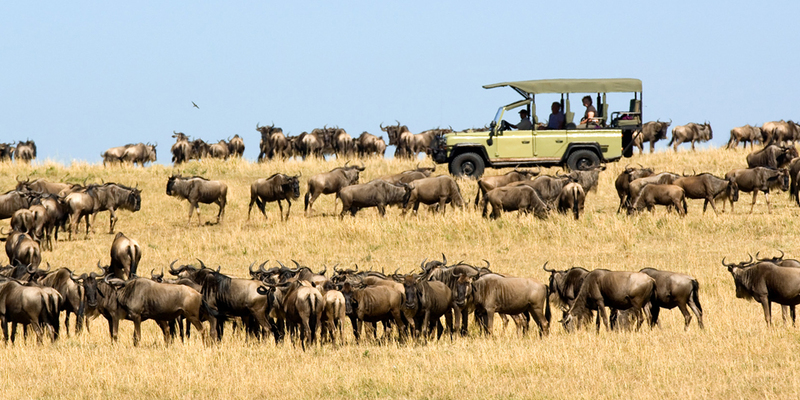 Game drives offer an excellent insight into the variety of habitats and the Moru Kopjes is currently one of only two areas in Serengeti where this illustrious animal can be viewed. Whether the drives are half day or full day incorporating a picnic lunch, guests can experience many different aspects of the Park; from the rolling plains of Southern Serengeti to the amazing rock formations in big cat territory of Moru Kopjes. One of the few places to almost certainly find the endangered black rhino is at the rhinoceros sanctuary in the area around the Moru Kopjes. A must-do adventure in this area is hot air ballooning; soaring over the savannah plains at dawn, watching the wildlife beneath you and finishing it off with a champagne bush breakfast is a once in a lifetime wilderness adventure. Dunia is a tented safari camp which has perfected the fine balance between a traditional safari and the comforts of a permanent camp. Eight spacious, luxurious safari tents are constructed on raised wooden decks, with spectacular views across the savannah and acacia woodland. Available with either a large double bed or twin beds, all have fully operational en-suite bathrooms with bucket showers and private verandas. Electricity is limited in tents, power for lights is fine, charging of any other appliances can be done in the main tent. There are two mess tents that act as a very comfortable main guest area and a bar, and a restaurant offering fantastic service and gourmet cuisine. Private dining can be arranged on the guest tent verandas for those preferring a more intimate dining experience.